I rarely muster much enthusiasm for restaurant promotions. You know, restaurant-fests the likes of Dine Around Seattle (formerly “25 for $25”), Boston’s Restaurant Week, Dine Out Vancouver. I certainly covered Seattle’s restaurant promotions a lot while food editor at Seattle Magazine. I’m sure they’ve got legs as a means for restaurants to fill seats in low seasons and draw in new patrons who hopefully will return to dine at non-promo rates. But for me personally, I’m still relishing the novelty of dinner at home after those seven years of excessive dining out (Seattle Magazine coupled with being editor of the local Zagat guide). A bargain isn’t enough. All that to set up this contradiction: a new restaurant promotion that did grab my attention. And it may make me book a few reservations to take part. It’s called Seasoned Seattle and shines the spotlight on restaurants that have been in business for twenty years or longer. In restaurant years, that’s what? maybe 45 or 50? definitely the sign of maturity and some deep local roots. I’ve always leaned more toward the old than the new. Houses, cars, movies, music. In so many arenas, there is something about my personality that connects with and delights in the character that comes with age. I’m a happy camper in my 1956 house, driving an old Jetta, watching Cary Grant and listening to Frank Sinatra or Blossom Dearie. With my growing-more-charming-by-the-year husband by my side. This attraction is no less true of restaurants. While of course I love to check out the latest-greatest dining spots to come on the scene, when I’m “off duty” and just dining out for pleasure, those aren’t necessarily the first choices on my list. I love returning to the favorite haunts in town, places where there’s history, context, a story to tell, a longtime relationship with their neighborhood and the community. 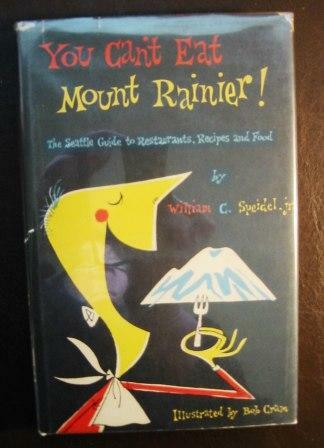 One of my favorite Seattle books is the one-of-a-kind You Can’t Eat Mount Rainier! , by Bill Speidel. It was published in 1955 and serves as what I believe to be the first restaurant guide ever written for Seattle. It was a time when Continental cuisine flourished in restaurants. Locals picked wild berries and tossed out crab pots for supper, but the idea of this region having a distinct “cuisine” that was worthy of restaurant tables hadn’t yet gelled. There were 53 restaurants included, each with a signature recipe ranging from Sukiyaki to Frikadellar (Danish Meatballs), Lobster Thermidor to Chicken Pot Pie. But a few regional items like Baked Fillet of Salmon and Dungeness Crab in Wine Sauce. What I revel in about that book is that more than a few of those restaurants are still in operation. We lost a couple in recent years, the Cloud Room and Andy’s Diner. Stalwarts include Alki Homestead, Bush Garden, Canlis, Ivar’s Acres of Clams, the Georgian Room (now just “The Georgian“). Those latter two are among the restaurants in this well-seasoned promotion happening in April. Others newer on the scene include Madison Park Cafe, Queen City Grill and 13 Coins. I hope those of you in the Seattle area might make a point of visiting some of these older restaurants in town, during the promotion and beyond. New and hip is all fine and good. But how colorful and textured would life be if that was all we had to choose from? Don’t even get me started on the debate about the Manning’s restaurant site in Ballard. Or the fact that the Twin Teepees was torn down to become, essentially, a vacant lot. For every multi-use, condo-retail complex that goes up in town, I hope we can preserve at least one building, one restaurant, one link to our past that won’t go the way of the dodo.